Wilson had been elected a member of the British Ornithologists Union in 1900 and although he was far too over-worked to attend many meetings he was reputedly one of its most popular members. He enjoyed the excursions to places of ornithological interest, such as Lord Rothschild’s collection at Tring, and it brought him into contact with the leading ornithologists of the day. Dr. Sclater introduced him to Professor Pyecraft the famous bird osteologist with whom he subsequently enjoyed working; Ogilvie-Grant introduced him to Lord Lovat which brought him work with the Grouse Disease Inquiry; and Wilson was also introduced to Eagle Clarke. Not long afterwards, Wilson publicly debated the subject of penguins with Eagle Clarke and the Hon. Walter Rothschild at one of the meetings of the Union. It wasn’t long before Eagle Clarke asked Wilson to illustrate his revised edition of Yarrell’s, A History of British Birds. Eagle Clarke was a noted ornithologist and the combination of his editing and Wilson’s illustrations promised a classic work. Wilson was utterly delighted. Nevertheless, he went out of his way to point out that he had already undertaken several commitments and wondered whether it might not be better to find someone else? Eagle Clarke was adamant, however. As the publishers later noted, “it was he who was so anxious for the work to be given to Dr. Wilson.” Of all of Wilson’s projects, in many ways this was the one that he most desired to fulfil. As with the mammals, Wilson wanted every illustration, wherever possible, to be based on personal observation of the live bird. 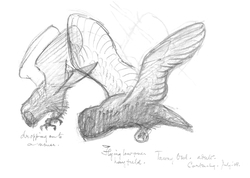 However, the quality of optics was still not very high in the early part of the 20th century and so the live sketches still needed to be filled in with plumage studies of dead specimens. Wilson was soon occupied in making sketches and notes on the natural pose and flight patterns of birds whenever the opportunity arose, whether in the field or at the London Zoo. He also studied bird skins in Museum collections. He then combined these preparatory studies into plates designed to meet client expectations. The production of illustrations for 350 species of bird was daunting but Wilson worked through them, one at a time. The quiet self-discipline of his Christian asceticism enabled him to accomplish an extraordinary amount of work. Almost every moment that he was not at work on the grouse, he was busy with his pencils and brush working on the British birds and mammals. Wilson thought that one of the more delightful aspects of the bird and mammal projects was to bring him into touch with the commissioning publishers, Oliver and Boyd in Edinburgh. He thought the two partners charmingly old fashioned, “of the Dickens type”, and they got on very well. They assured Wilson that the work that he was doing was taking him into “the first rank” of wildlife illustrators. One result of the connection were orders for a single plate for each of Chapman’s Bird-life of the Borders and Nape’s Nebula to Man, these Wilson duly executed. Wilson in return persuaded the Royal Society to place the publication of the National Antarctic Expedition 1901-1904, Album of Photographs and Sketches, which he was editing, into their hands. In July of 1908, Wilson had a meeting with Eagle Clarke and Oliver and Boyd who were full of praise for the bird work that he had so far executed. Oliver and Boyd even went so far as to give him a £50 cheque (equivalent to £3000 today) as a “reminder”. This seems like quite a sum but is in line with the market rate for Wilson’s paintings at the time. Wilson occasionally sold paintings to order, but he disliked doing so, quite apart from his other work commitments. However, it is recorded that he sold two of his pictures for around £70 (equivalent to £4000 today) during 1906. Nevertheless, it was a generous gesture from Oliver and Boyd, who knew how much work he was trying to get through. What none of them yet knew was of his intention to head South with Scott again, as these plans remained uncertain until Shackleton returned in 1909. Wilson continued with the execution of bird plates and had a further meeting with Eagle Clark and Oliver and Boyd in early 1909. Once again, they were full of praise for his work. It was almost in stark contrast to Barrett Hamilton, who tore Wilson’s pictures to shreds and made him re-paint them, just as often as he praised them. However, Wilson was too busy to worry and took the comments at face value. Shackleton returned from the Antarctic in June 1909, a hero for getting within 98 miles (176km) of the Pole, but he had failed to attain it and so had left the job for Scott to finish. Scott rapidly got his dormant plans under way and Wilson was publicly confirmed as the Chief of Scientific Staff. Wilson hoped that this position would help him to get a regular billet on his return, so that he could settle down with his wife, perhaps in his long-hoped for role as a Government scientist in New Zealand. Many of Wilson’s friends tried to dissuade him from going South again but he was already committed. His friendship and loyalty to Scott were strong and they were determined to finish together what they had started aboard Discovery. Wilson was now in serious difficulties with regard to meeting all of his work commitments. He was busy painting and writing at all hours of the day. It was with some relief, therefore, that as soon as Oliver and Boyd were informed of the pending Expedition, they agreed to postpone the fulfilment of the contract for half of the bird plates until the Expedition’s return, provided that Wilson met the contract for the first half of the plates before the Expedition sailed. Their letter was accompanied by another cheque to cover his “expenses”. Once these arrangements were confirmed in September, Wilson was naturally delighted and somewhat relieved. It was a considerable shock to Wilson, therefore, to open a letter six weeks later from Eagle Clarke. 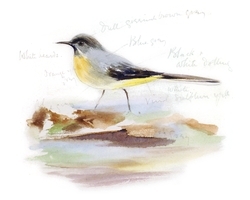 Its exact contents are unknown but Wilson wrote to Oliver and Boyd in complete disbelief: “He seems quite recently to have made up his mind that my Bird Drawings are after all not at all what is wanted, and his further criticism seems to me most unnecessarily scathing … I remember the remarks which he made upon the very same pictures earlier in the year.” Wilson’s letter crossed with one written by Oliver and Boyd, which arrived with Wilson the following day: “We regret very much to inform you that neither Mr. Clarke or Ourselves are satisfied with the Bird Drawings … we fear that you have had too many other engagements on hand to permit of your giving the Bird Drawings the time and attention they require.” Wilson was stunned but accepted the termination of the contract without further payment. There was, and remains to this day, considerable confusion about why the contract was cancelled. There is no doubt that Wilson did have too many engagements on hand but arrangements had been made to accommodate this and it seems extraordinary to cancel them within weeks. It also seems extraordinary to praise paintings one day and condemn them the next. Wilson’s father suggested that the real reason was that they had decided that the book was to be published before Wilson returned from the Antarctic, but it never appeared. James Thin recalled years later that the whole business was “a very painful one” but that the matter was in the hands of Eagle Clarke. He also suggested to George Seaver that if something had to be written: ” … it could only be that owing to Dr. Clarke’s health he was unable to carry out his intention of editing the book and asked us, as publishers to relieve him of his contract; the project was abandoned and Dr. Wilson’s commission was cancelled.” This is not, however, what was said at the time. Perhaps it was simply the product of the fact that Wilson was wrestling on the forefront of wildlife painting, desperate to produce images of live birds and yet constrained by technical and aesthetic restrictions to his work. Perhaps as a result, his work was too much of a compromise. It seems peculiar, though, that nothing was said to him; he would happily have repainted the images, as he did with the mammals. In any case, when judged from our modern viewpoint, the plates that he completed seem no worse than those of his contemporaries. It seems unlikely that we will ever know the truth of the matter. Wilson had little time to lick his wounds. 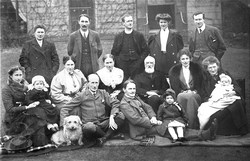 The Wilson family gathered at the family home at Westal in Cheltenham for what was to prove to be the last such family Christmas. Wilson was busy with work for the Grouse Disease Inquiry, the British Mammals and drawing up a scientific programme for the forthcoming Expedition, along with finding the scientists to fulfil it. As he sailed Southwards aboard Terra Nova, he cut a familiar figure on deck, with his binoculars around his neck, watching birds. 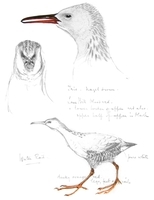 Amongst the belongings that Wilson left behind were the preparatory drawings and plates for the British Birds project, in various stages of completion. They provide a unique insight into the way that Wilson worked up his pictures and hold the long forgotten promise of a magnificent ornithological work. Some years after his death a few of the plates were used to illustrate Hesketh Prichard’s Sport in Wildest Britain. Occasionally the images have been admired by eminent ornithologists and artists and occasionally there has been discussion of their publication. But mostly the pictures have lain more or less forgotten for 100 years.